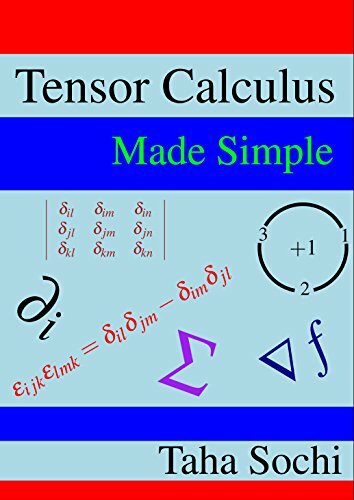 This book contains the detailed solutions of all the exercises of my book: Tensor Calculus Made Simple. 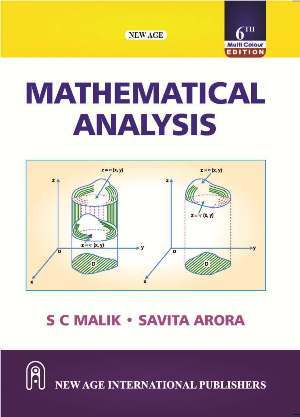 The solutions are generally very detailed and hence they are supposed to provide some sort of revision for the subject topic. 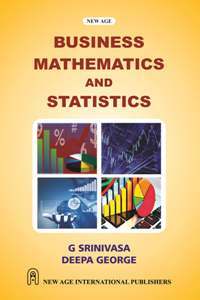 The author of the book possesses a diverse academic and research background. He holds a BEng in electronics engineering, a BSc in physics, a PhD in petroleum engineering, a PhD in crystallography, and a PhD in atomic physics and astronomy. He also worked as a postdoctoral research associate for several years. 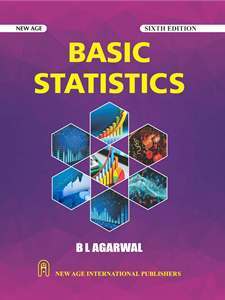 He published dozens of scientific research papers in many refereed journals and produced numerous academically oriented documents which are freely available on the world wide web. 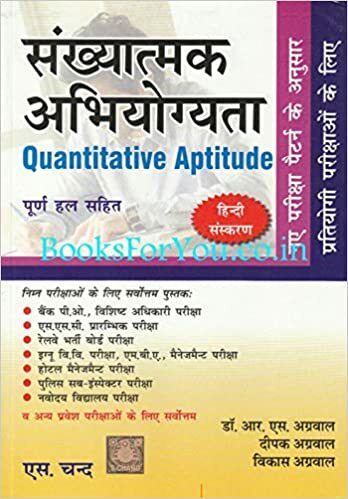 R.S Aggarwal Quantitative Aptitude is the most preferred book for SSC EXAMS, BANK PO, MBA, MAT, CAT, RAILWAY and many other competitive exams. 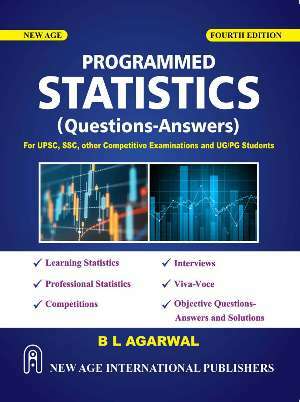 for SSC aspirant, it is the most useful book for Quantitative aptitude. 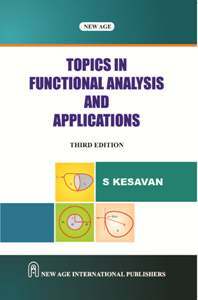 Over 1500 problems are used to illustrate concepts, related to different topics, and introduce applications. 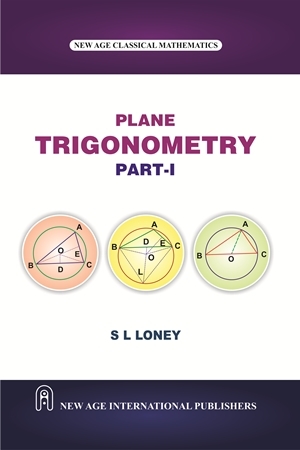 Over 1000 exercises in the text with many different types of questions posed. 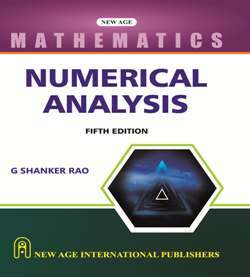 Precise mathematical language is used without excessive formalism and abstraction. 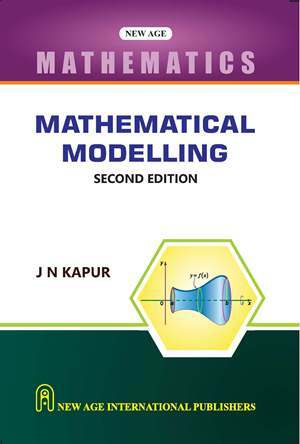 Care has been taken to balance the mix of notation and words in mathematical statements. 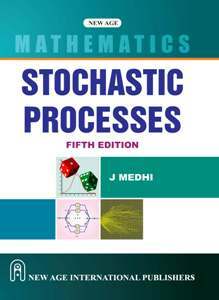 Problem sets are stated clearly and unambiguously, and all are carefully graded for various levels of difficulty. 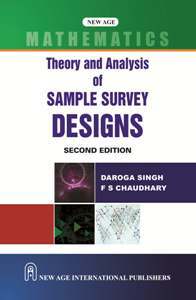 This text has been carefully designed for flexible use. 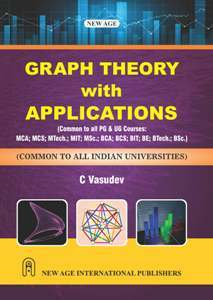 C. Vasudev is working as Assistant Professor in the Department of Mathematics, K.S. Institute of Technology (Kammavari Sangham), Bangalore. 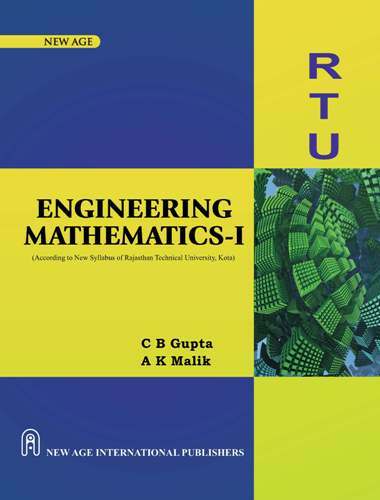 He has been teaching undergraduate and postgraduate courses in mathematics. 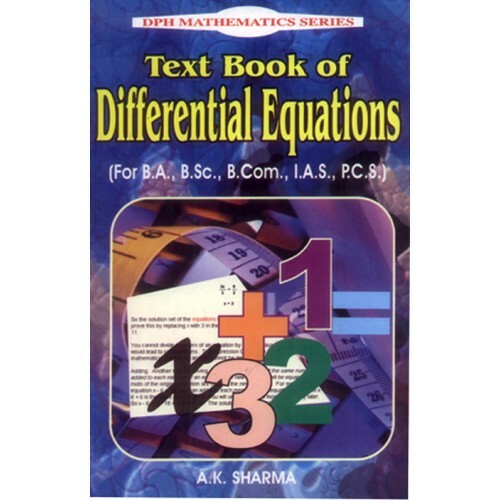 He has a profound interest in writing textbooks and has good teaching record over the years. He has already authored over a dozen books and many more are yet to come. 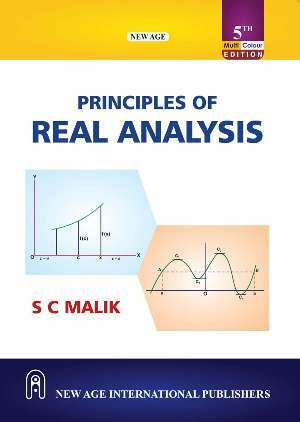 Clarity and an illustrative quality are the highlights of his books that have evoked enthusiastic response from the readers. 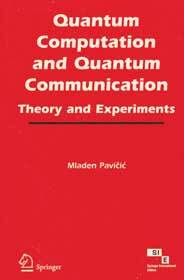 Contents:– Solution in series, Picard’s Iteration Methods (Uniqueness and Existence Theorem), Partial Differential Equations First Order, Partial Differential Equations with Constant Coefficients, Partial Differential Equations of Order Two, Monge’s Methods of Integration, Linear Partial Differential Equations, Singular Solution, Exact Differential Equations (Particular Forms), Numerical Integration, Wave, Heat, Laplace and Diffusion Equations, Boundary Value Problems, Linear Differential Equations (Matrix Method), Cobweb Phenomenon and Generating Functions. 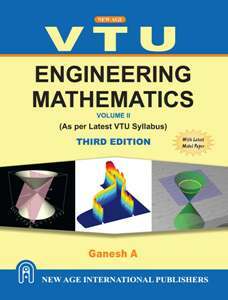 The book has been divided into nine chapters. 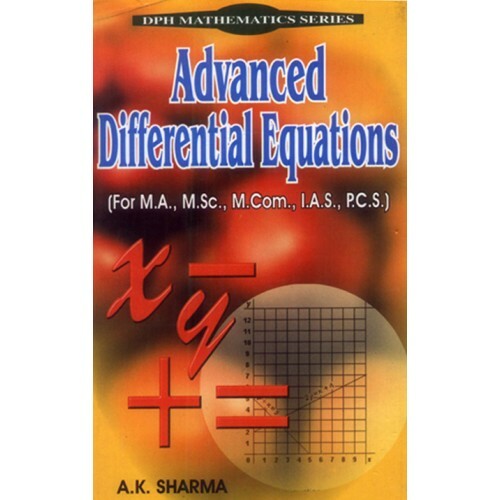 It deals the introduction to differential equation, differential equation of first order but not of first degree, the differential equation of first order and first degree, application of first order differential, linear equations, methods of variation of parameters and undetermined coefficients, linear equations of second order, ordinary simultaneous differential equation, total differential equations (Pfaffian Differential Forms and Equations). 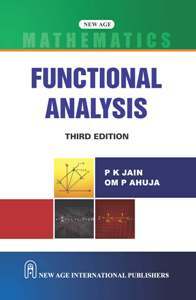 The book include fundamental concepts, illustrative examples and applications to various problems. 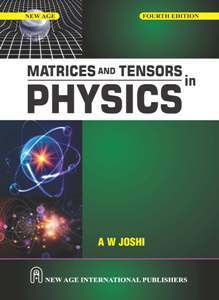 This book is about tensor analysis. It consists of 169 pages. 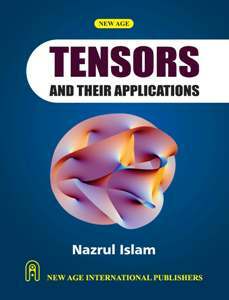 The language and method used in presenting the ideas and techniques of tensors make it very suitable as a textbook or as a reference for an introductory course on tensor algebra and calculus or as a guide for self-studying and learning. 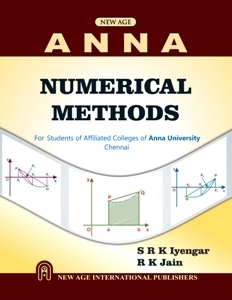 The book contains many exercises. 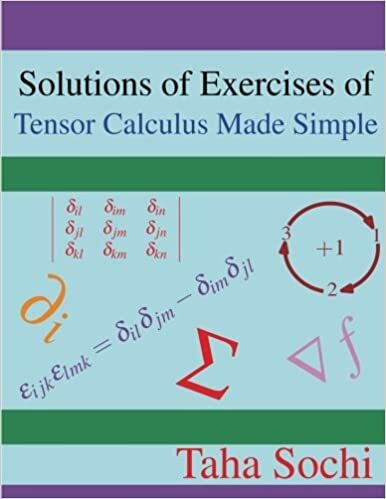 The detailed solutions of all these exercises are available in another book by the author (Solutions of Exercises of Tensor Calculus Made Simple). 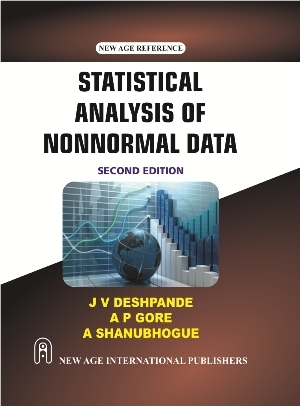 The author of the book possesses a diverse academic and research background. He holds a BEng in electronics engineering, a BSc in physics, a PhD in petroleum engineering, a PhD in Crystallography, and a PhD in atomic physics and astronomy. He also worked as a postdoctoral research associate for several years. 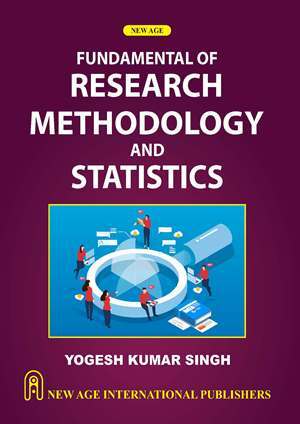 He published dozens of scientific research papers in many refereed journals as well as producing other academically oriented documents which are freely available on the world wide web. 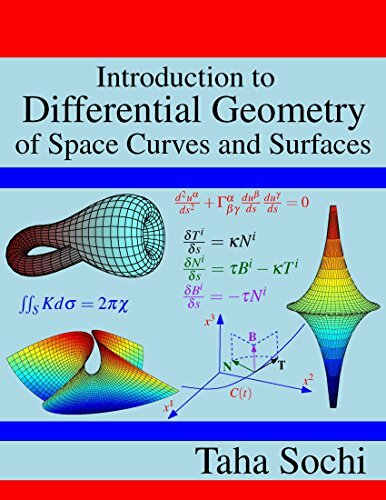 This book is about differential geometry of space curves and surfaces. 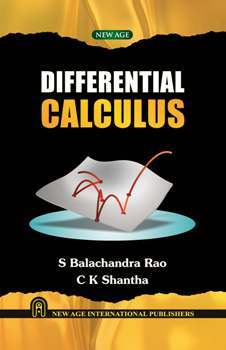 The formulation and presentation are largely based on a tensor calculus approach. 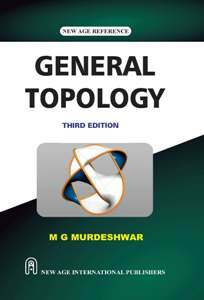 It can be used as part of a course on tensor calculus as well as a textbook or a reference for an intermediate-level course on differential geometry of curves and surfaces. 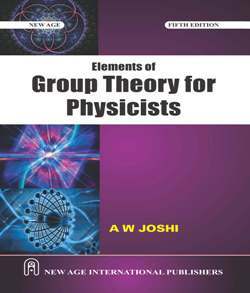 The book is furnished with extensive sets of exercises and many cross references, which are hyperlinked, to facilitate linking related concepts and sections. 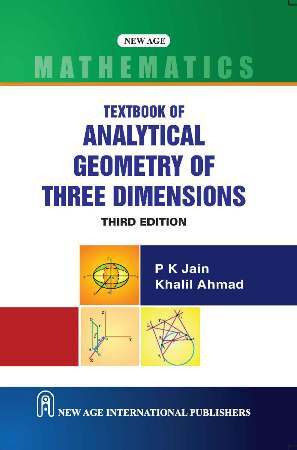 The book also contains a considerable number of 2D and 3D graphic illustrations to help the readers and users to visualize the ideas and understand the abstract concepts. 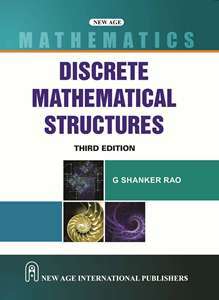 We also provided an introductory chapter where the main concepts and techniques needed to understand the offered materials of differential geometry are outlined to make the book fairly self-contained and reduce the need for external references. 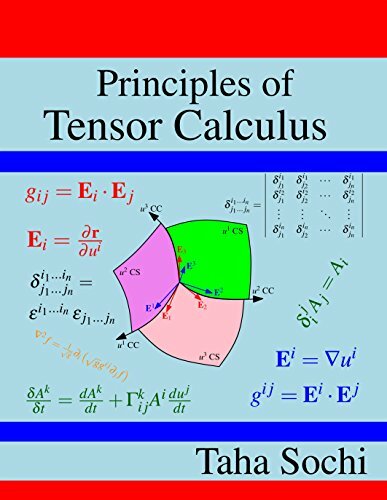 This book is based on my previous book: Tensor Calculus Made Simple, where the development of tensor calculus concepts and techniques are continued at a higher level. 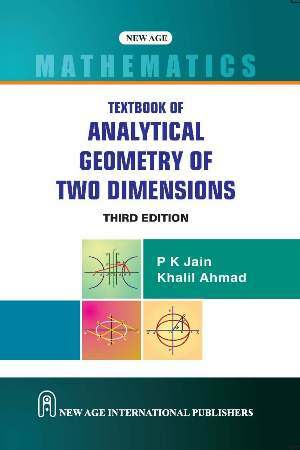 Unlike the previous book which is largely based on a Cartesian approach, the formulation in the present book is based on a general coordinate system. 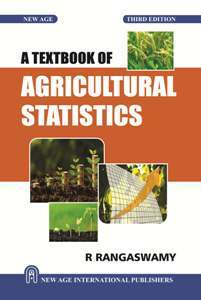 The book is furnished with an index as well as detailed sets of exercises to provide useful revision and practice. 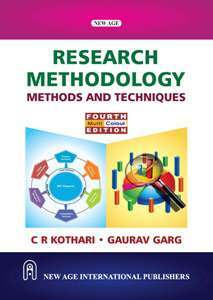 To facilitate linking related concepts and sections, cross referencing is used extensively throughout the book. 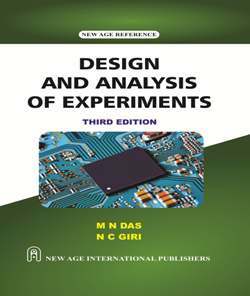 The book also contains a number of graphic illustrations to help the readers to visualize the ideas and understand the subtle concepts. 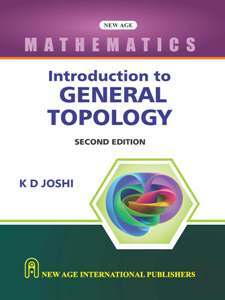 The book can be used as a text for an introductory or an intermediate level course on tensor calculus. 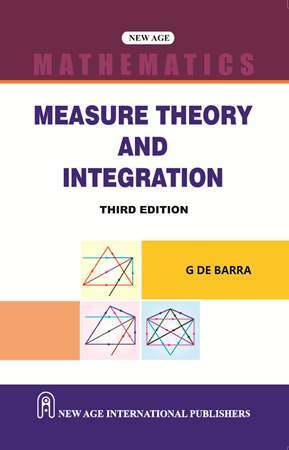 Over 900 exercises (problem sets) in the text with many different types of questions posed. 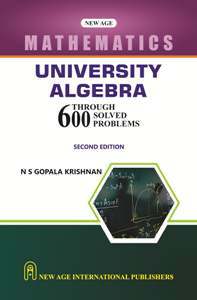 Problem sets (exercises) are stated clearly and unambiguously and all are carefully graded for various levels of difficulty. 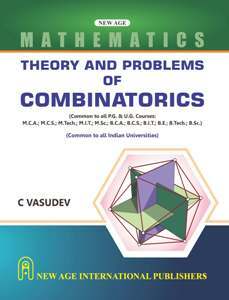 Combinatorics is the mathematics of counting, selecting and arranging objects. 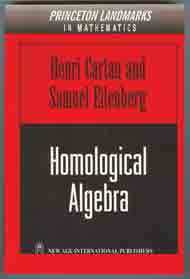 Combinatorics include the theory of permutations and combinations. 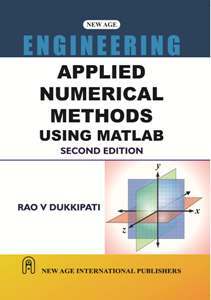 These topics have an enormous range of applications in pure and applied Mathematics and Computer Science. These are processes by which we organize sets so that we can interpret and apply the data they contain. Generally speaking, combinatorial questions ask whether a subset of a given set can be chosen and arranged in a way that conforms with certain constraints and, if so, in how many ways it can be done. 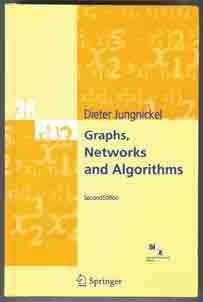 Applications of combinatorics play a major role in the analysis of algorithms. 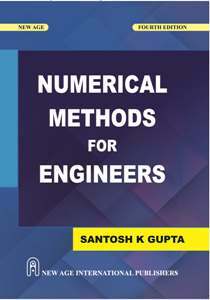 For example, it is often necessary in such analysis to count the average number of times that a particular portion of an algorithm is executed over all possible data sets. 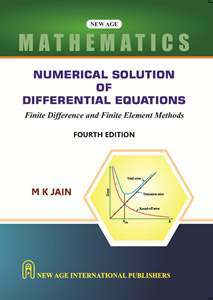 This topic also includes solution of difference equations. 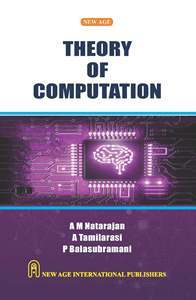 Differences are required for analysis of algorithmic complexity, and since computers are frequently used in the numerical solution of differential equations via their discretized versions which are difference equations. 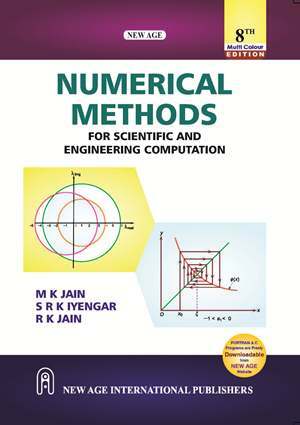 It also deals with questions about configurations of sets, families of finite sets that overlap according to some prescribed numerical or geometrical conditions. 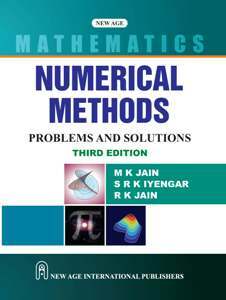 Skill in using combinatorial techniques is needed in almost every discipline where mathematics is applied. 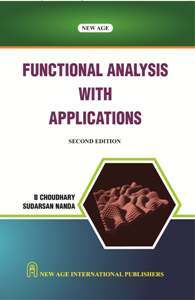 Over 1000 problems are used to illustrate concepts, related to different topics, and introduce applications. 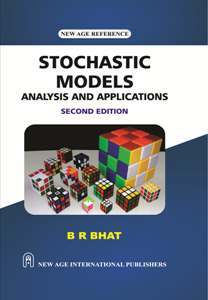 Problem sets are started clearly and unambiguously and all are carefully graded for various levels of difficulty. Created by GOODWILL exclusively to help you 1. Prepare for any basic skills examination. 2. Review what you learned or forgot in high school. 3. Get extra help with your high school or college programme. SKILL BUILDERS helps you acquire practical, essential skills FAST, through a series of simple 20-step programmes: Reading, Comprehension, Vocabulary & Spelling, Writing Skills, Practical Math, and Reasoning Skills – all in 20 minutes a day. 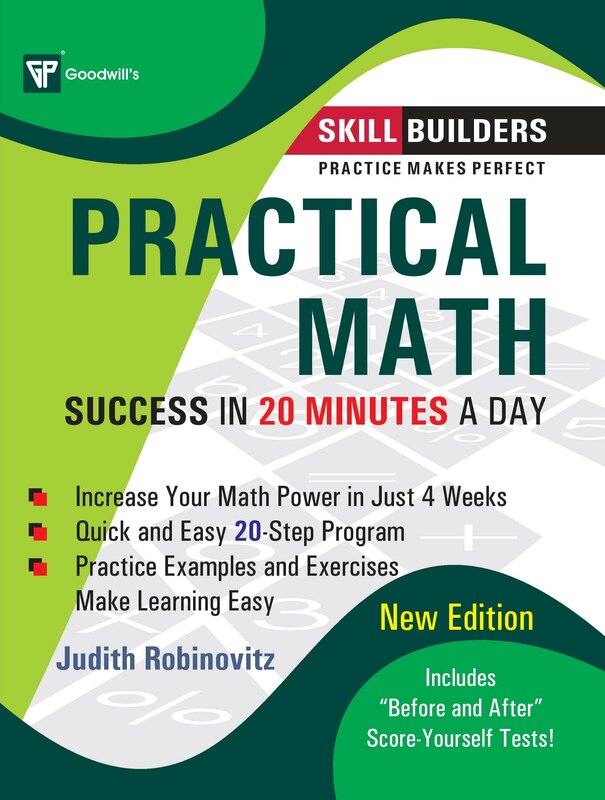 PRACTICAL MATH: SUCCESS in 20 Minutes a Day Not everyone is good in maths. 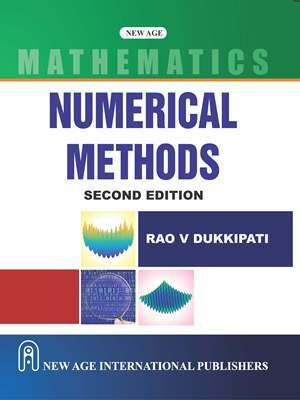 But “math literacy” is essential for getting ahead in our high-tech modern world, as well as for most standardised tests. 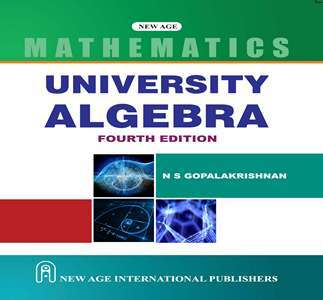 This book has been created specifically to guide you through the math you learned in high school but forgot – pre-algebra, algebra and geometry – painlessly in just 20 easy steps. Each step takes just 20 minutes a day. What makes this PRACTICAL MATH skill builder so effective? 1. An introductory diagnostic test helps you PINPOINT your STRENGTHS and WEAKNESSES. 2. 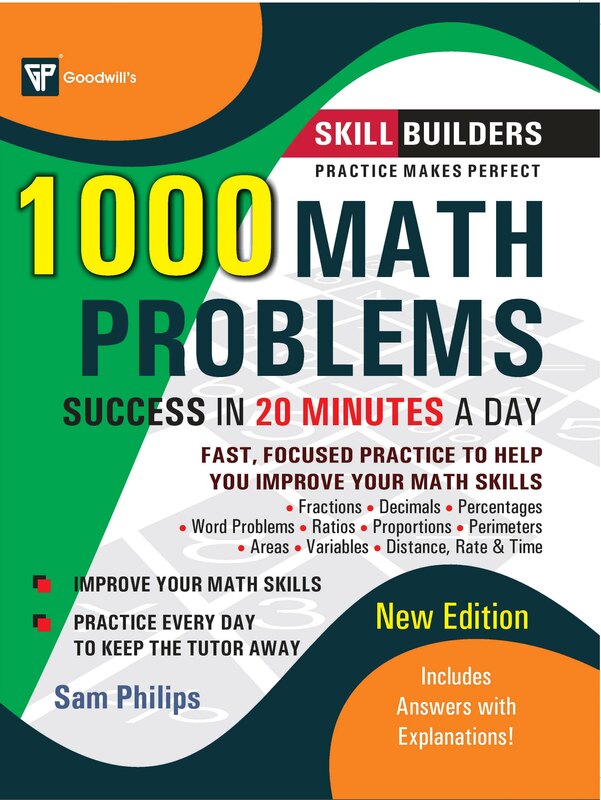 20 STEPS cover all VITAL MATH SKILLS, from dealing with word problems (commonly used in testing) to figuring out odds and percentages. 3. EXERCISES are in TEST FORMAT (giving you plenty of practice for test-taking). 4. Each step is designed for SPEED in learning. 5. Works from easy problems to more difficult ones to make learning EASY. 6. Post-test shows you the PROGRESS you’ve made. 7. BONUS SECTION – ‘Preparing for Standardised Test’ – Tips for scoring your best. 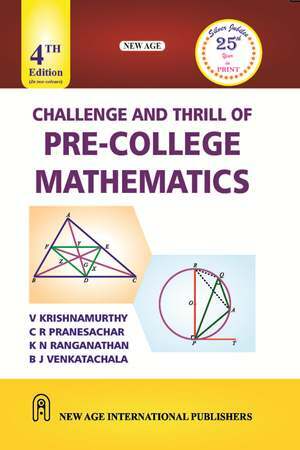 1000 Math Problems is meant for those who want to hone their skills in mathematics by practising the subject more and more. 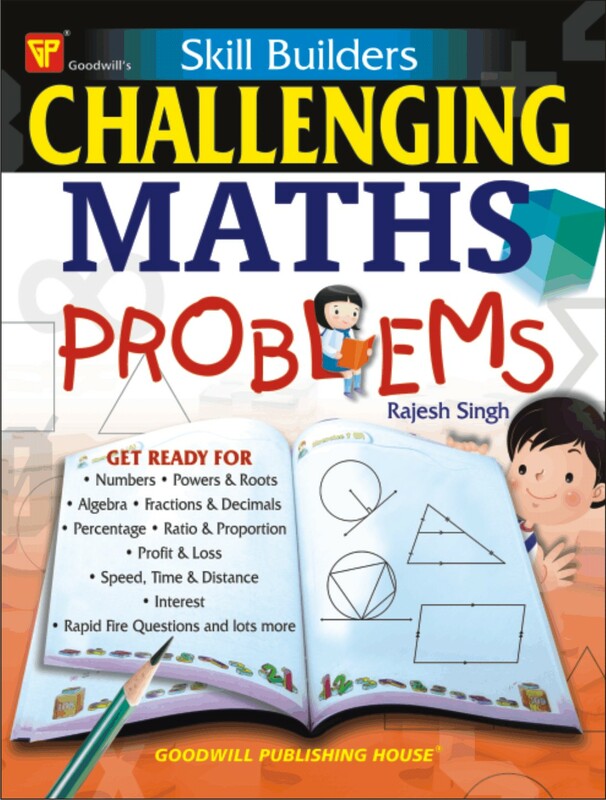 The book contains math problems on fractions, decimals, percentage, ratios, proportions, perimeters, areas, variables, distance, rate & time and many more. 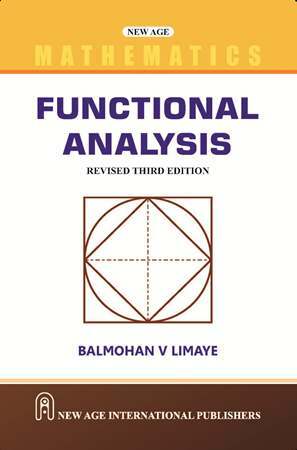 The problems are framed in a way that the practitioner has to sufficiently exercise his intellectual capabilities at the subject to solve the problems. 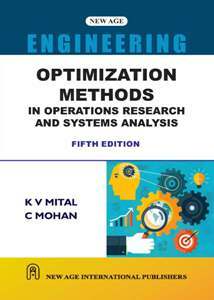 Thus, the problems in the book offers the learner additional opportunity to develop their intelligence quotient. 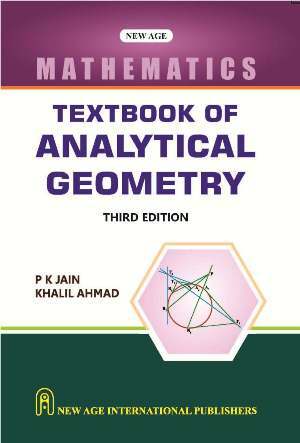 The book is a must read for everyone aiming to gain proficiency in the subject. You don't have to be a genius to tackle these puzzles. These have been designed to be both amusing and challenging. These puzzles will test your mental powers for hours and hours and will help you to become better learners. At first glance you may find that some look a bit daunting, but rest assured, you do not need any specialist knowledge to solve them. If you approach them in the right way, using lateral thinking and by being open to new, creative solutions, you will find that you come up with many, if not all, of the correct answers. By the time you finish this book, those powerful skills will be back on track, probing your everyday experiences for a more thorough and deeper understanding. 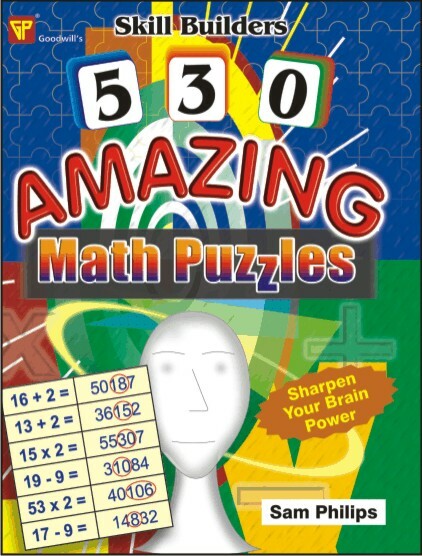 In addition to being fun to do, these puzzles offer an arena to practice thinking skills. Professor Picanumba can predict what you're thinking-certain numbers, words, or pictures that will come up right almost every time. Try these fun tricks and see! Then you can astound your friends and family with your mental magic-and never tell how you did it. 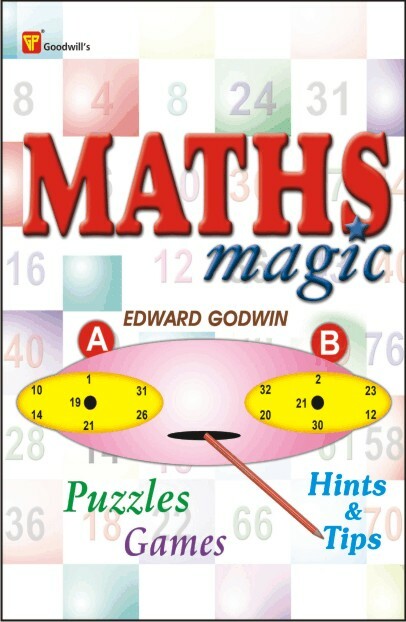 Maths Magic is the perfect book for those of you who love numbers as well as those of you who don't! 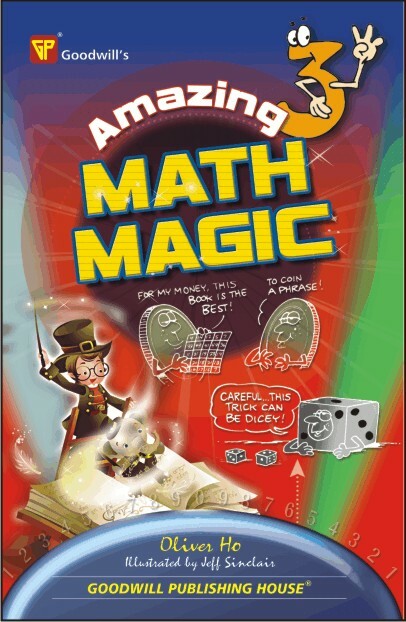 Packed with entertaining but challenging number and mathematical puzzles, Maths Magic is divided into five levels of difficulty and has something to tax active minds of all ages and abilities. 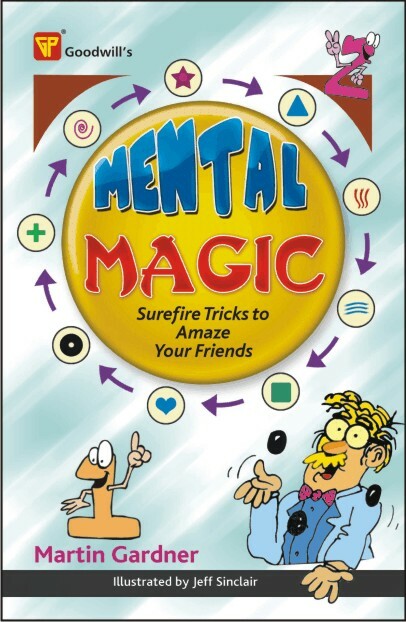 When you perform the tricks in this book, you'll have people believing you can read minds, calculate huge sums quicker than lightning, and make predictions that work every time! More importantly, you'll be able to entertain yourself, your friends, and your family with cool tricks anywhere, at any time. Many of the tricks can be done with just a pen and paper, or a calculator. Some involve a deck of cards, some coins, or some dice. Other tricks use props that you can easily make by yourself, and others use items that you'll find at the dinner table. 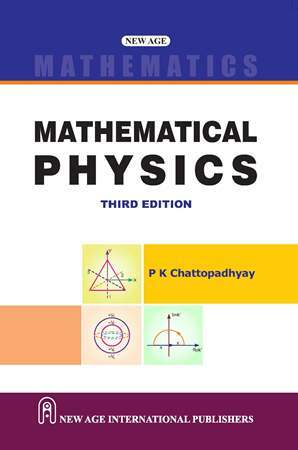 All of the magic tricks in the book involve some principle of mathematics, either in their secret or in their presentation. They're all easy to learn and can be mastered with only a little bit of practice. 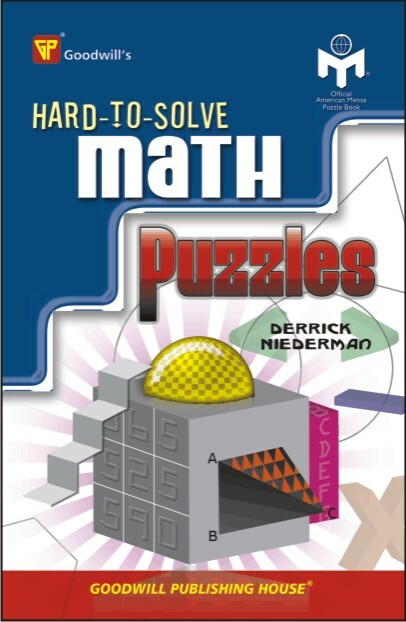 Hard-to-solve doesn't mean you need to know any higher math to do the puzzles in this book. There are no prerequi­sites of differential calculus, functional analysis, linear algebra, or anything like that, But while the puzzles don't require advanced mathematics to state, they do require insight to solve: How can you divide a regular pentagon into five iden­tical pentagonal shapes? What is the only decade in American history to contain four prime-numbered years? 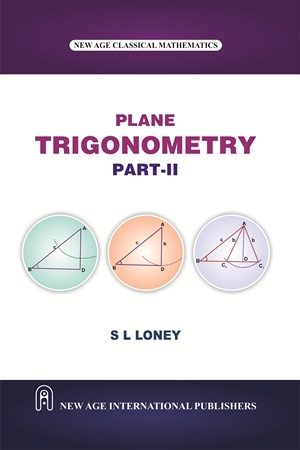 What three right triangles with integer sides have areas numerically equal to twice their perimeters? If you don't see the answers just yet, don't give up. Remember, you have plenty of company. But if you come up with the right insight and solve the puzzles, you'll have a satisfaction you won't forget. This is one book that you'll be proud to carry around. This book wouldn't have been possible without the work of some giants in the field. The author extends his thanks to everyone who showed how much fun puzzles are, from 19th­century greats Sam Loyd and Henry Dudeney all the way to Martin Gardner. The work of Joseph Madachy, Leo Moser, Harry Nelson, Arlet Ottens, Richard Stanley, and other top­notch puzzle makers and solvers has also had a great influence. Rob Blaustein suggested some interesting puzzle concepts. Fraser Simpson provided timely and thorough proofreading. Last but not least, my editor Peter Gordon put everything together into a tidy little book. Thanks to all. 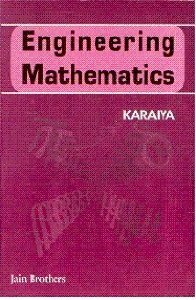 This book is filled with exciting and interesting mathemagic tricks that will appeal to children of all abilities, ages eight and up. 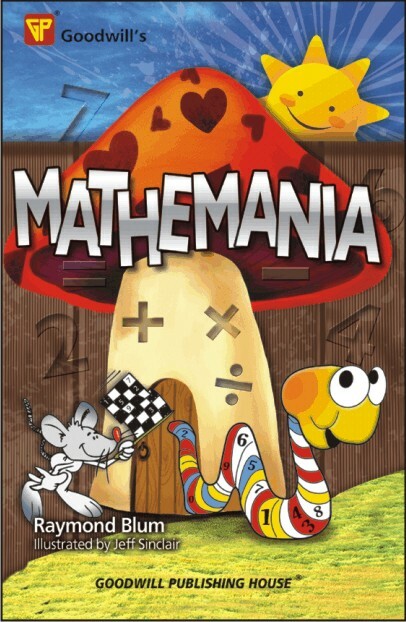 Mathemagic combines magic and numbers in a way that will help spark children's interest in mathematics. All these number tricks have been classroom tested. Children love them and will enjoy performing them for family, friends, and their entire math class. Number magic is easy for children to learn and perform because the tricks work practically by themselves. You don't need to know sleight-of-hand or have any special skills or expensive magic equipment. You can easily find most of the supplies around the house or purchase them at minimal cost. The tricks have clear, uncomplicated, step-by­step instructions, so they are simple for children to read and understand. There is a glossary for looking up unfamiliar words. The book is orga­nized so children can open it up, pick out a trick, and learn it on their own. . Number magic adds variety and excitement to any math class and helps make learning fun. 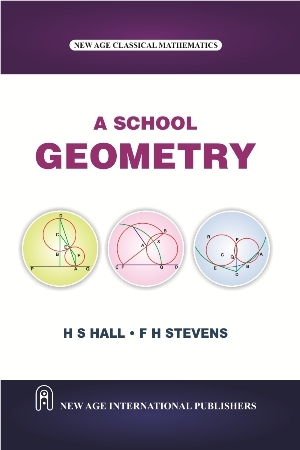 Math teachers at any level can use this book to supple­ment their math program to create interest and stimulate learning. When learning is fun and exciting, children become intrigued and are moti­vated to learn more. This book helps provide that motivation.